A fun custom candle with a custom window tin and a full color label. 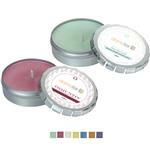 Aromatherapy with essential oil infused soy wax and your choice of fill. Match the many candle color choices with your logo. A great custom candle for the holidays or everyday! Dimensions: Approximately 4 oz. 1 3/4" x 2 3/4"